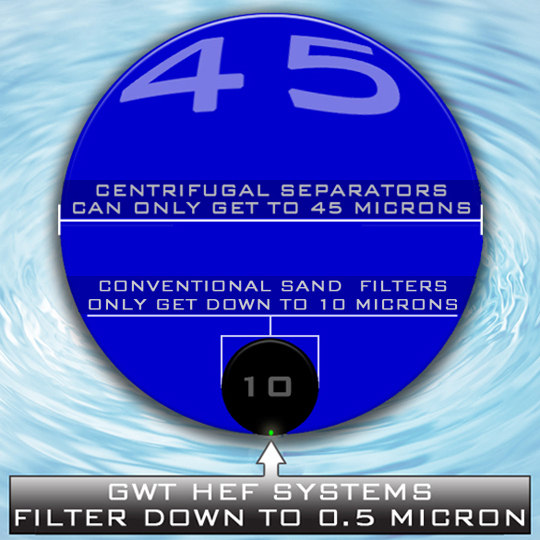 GWT’s Revolution High Efficiency Filtration Systems use Cross-Radial Flow Technology, a technique that maximizes contact between process water and the filter’s media resulting in sub-micron filtration performance. Additionally, by not compressing the media with a direct downward force, Cross-Radial Flow provides excellent flow rates with little mechanical resistance. Better flow rate allows for larger volumes of water to be treated than other systems of the same footprint while using only a fraction of the energy. As seen below, in a Cross-Radial Flow design, water makes contact at a tangential angle with the filter’s media. The angle at which the water impacts the filter’s media creates narrow passages between media crystals. This angle creates the scrubbing effect that traps microscopic particles above media surface level. 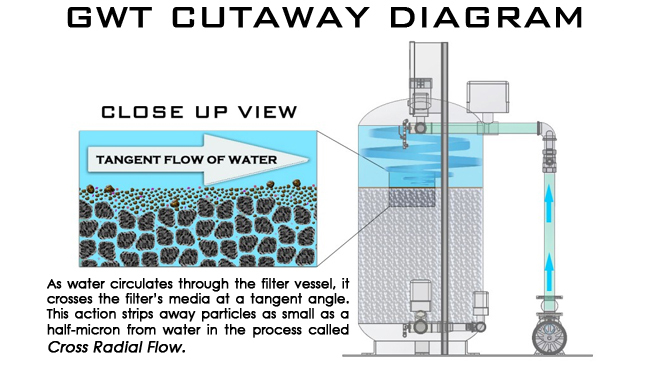 About 98% of total suspended solids (TSS) are removed on every pass, and clean water exits the filter. Revolution HEF Systems require very little maintenance to operate. When pressure sensors recognize the filter is congested, the automated low-flow backwash cycle uses clean water to expel the trapped particles and debris through a secondary drain valve. After just a few minutes, the particles are gone. and the HEF System returns itself to filtration mode. Compared to other industrial filters, it’s easy to see the difference the Revolution provides.